Oh, how do I even begin to talk about how amazing this Lake Louise elopement was? It’s not just because the locations are amazing, they are, but this couple were truly my kind of people. I’m not going to mention them by name, otherwise you’ll try to stalk them and befriend them yourselves because of their awesomeness and we just can’t have that! Why are they my kind of people? Well, not only do they both have an incredible sense of humour, but they are cat people! Our bride had the most awesome cufflinks made for her groom as a surprise gift. SHe gave them to him after their first look, knowing that he would be more excited to see his precious kitty baby immortalized on cufflinks than to see her in her dress and they laughed about that! We tried our luck and pushed to the edge of Lake Louise to do a lake side ceremony rather than go up in the meadow. Since it was just the two of them, we figured the crowds would hold back for the 10-15 minutes it took for the ceremony. We did gather quite the crowd of onlookers including a couple Japanese girls who filmed the whole thing, fighting tears and had photos with the bride afterwards! Once we were done their Lake Louise elopement ceremony we headed off to Moraine Lake where there were more amazing views and we had such a fun time! We hiked the rock pile and got an amazing sunset! These two were up for anything, and if you scroll all the way to the bottom you’ll see the kind of work that goes into getting these amazing mountain pictures! There were troopers! You can’t tell from the editing, but we finished the night after the sun set and they had to climb back down in the dark. 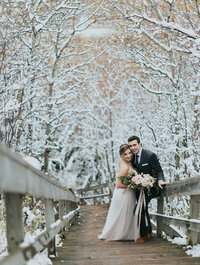 I wish I could show everything from this day, but I narrowed it down to these favourites from an amazing Lake Louise elopement this past fall! Are you newly engaged and are just dreaming about a Lake Louise elopement? I would love to photograph your elopement or intimate wedding in the Canadian Rocky Mountains! 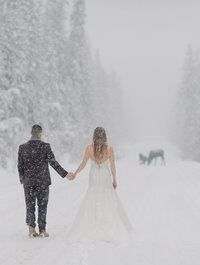 Please get in touch for more information on Lake Louise elopement wedding packages or for other mountain wedding destinations like Canmore, Kananaskis, Emerald Lake, Lake Louise, Peyto Lake or Moraine Lake. If you aren’t in the market for Lake Louise elopement Photos, I also do couples, anniversary sessions & proposals! Looking for more Lake Louise elopement & Moraine Lake wedding photos? 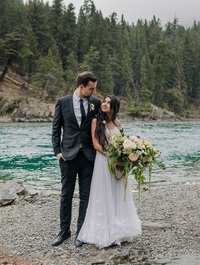 Check out this rainy Moraine Lake elopement! Or this Moraine Lake wedding! Or this Moraine Lake summer wedding! Try this wedding in Lake Louise! Or this intimate Moraine Lake wedding! Check out this post-wedding session at Moraine Lake! Or try this Lake Louise wedding with a heli adventure! 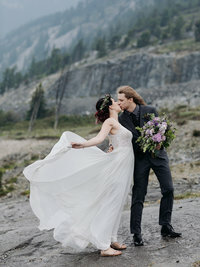 This Banff Elopement left me breathless!!! It’s such a beautiful spot to elope! Still cannot get over how dang blue Lake Louise is! This Moraine Lake elopement is everything adventurous and amazing!!! Who the heck wouldn’t want to elope in Banff?! !